The true measure of a person’s strength very rarely comes from their biceps or their brain, but from their heart and their capacity to endure life’s challenges. This is one of the reason’s I consider Angelica Byrd one of the strongest people that I know. 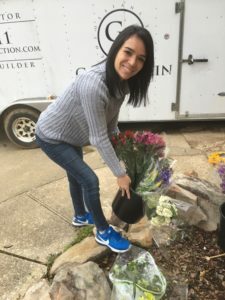 Angelica originally came to Grace Klein during a very challenging season of her life and like most of our most faithful volunteers, turned that personal need into an outpouring of blessing by serving at GKC as often as she can. Angelica can be found using her amazing organizational skills arranging shelves or channeling her creative side decorating boxes for our food delivery. She is proof positive that it takes a village to do all that we do at Grace Klein and a prime example of how giving during your own time of need can not only produce a blessing for others, but yourself as well. Angelica was referred to us through one of our partners and says one of the best things about GKC is how amazingly she sees God move while she’s here. “Jesus has come to give us life so we can live abundantly. Every time I come to GKC I don’t leave with my hands empty. God is helping me abundantly. God does not give because we are good kids, God loves us and gives generously. His grace is greater than we can understand. He puts us in positions so we can experience his love, so we can understand when He says, I will never leave you, never forsake you. GKC currently helps me with food, however the prayers of the GKC team members have a big impact in my life.” Angelica, we couldn’t agree more. Thank you for all you do!